SpaRitual offers the opportunity to smooth the soles, while nourishing the soul at the same time. Made with 71% certified organic ingredients, new Sole Mate Essential Moisture Balm works to repair, soothe, revitalize, and protect dry, tired feet. Featuring ingredients that are either fair trade certified or adhere to fair trade practices, Sole Mate is free of synthetic dyes, fragrances, parabens, petrochemicals, and preservatives. Ingredients include shea butter and baobab oil to soothe sore joints and hydrate and protect dry, cracked skin. 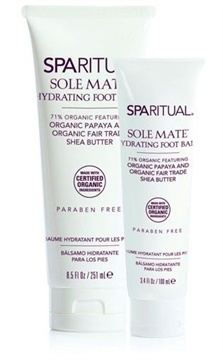 Scented with orange essential oil, Sole Mate helps dissolve and soften thick calluses and fights foot bacteria with papaya extract and tamanu oil. For more information, go to www.sparitual.com.